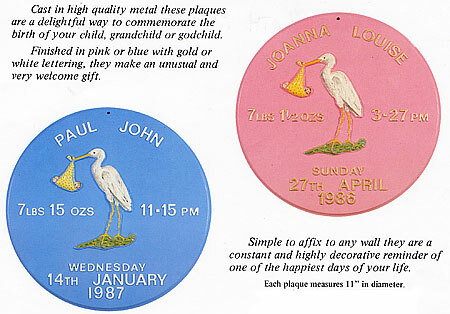 Hayne-West manufactures a range of quality anniversary, birth and gift plaques. Our special heart shape plaque can be personalised with names and a short message. It is the perfect way to commemorate special celebrations such as weddings and anniversaries and they make unusual Valentine’s day gifts. These lovely plaques are available in a white background with silver, gold, red or blue lettering, or a red background with white or gold lettering. They are suitable for indoor or outdoor use. For a new baby, our popular birth plaque, with its charming stork holding a baby in a blanket, makes a unique lifetime gift, which can be fixed to a child’s bedroom wall or door. Simply send us details of the baby’s name, date of birth and birth weight. Available in pink or blue background with white or gold lettering, or a white background with pink or blue lettering. Recommended for indoor use only.